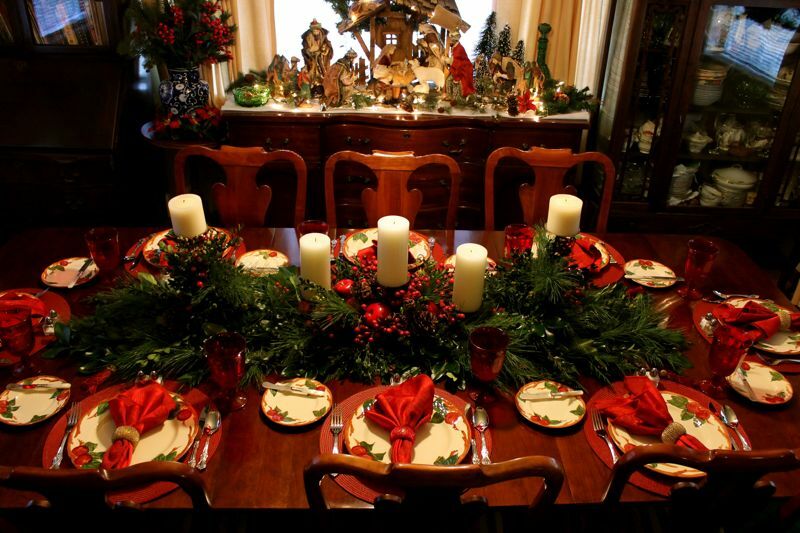 As the Christmas holidays start to wind down this week with the celebration of "Three King's Day" or "Los Tres Reyes Magos," I wanted to share one more Christmas table from my mom's dinner with her brothers and sister. I was flattered when she requested that I make a centerpiece and do the table for her. She wanted a centerpiece based on one I did for a Christpher Radko "Holiday Celebrations" HERE. We also decided that instead of one of several of her Christmas patterns, her Franciscan "Apple" would be perfect. These arrangements already had apples and berries. I pruned some of her shrubbery and added lots of white pine, cedar, boxwood and something I'm not sure of the name but it has a waxy leaf. No, it was not poison oak! I love, love, love how it came out! Only a dinner plate for the buffet dinner, and I should have gotten a photo of the beautiful ruby glass compotes they used for dessert, but didn't. No charger, just the woven round placemat, which takes up so little space. Honestly, I do not like to see an empty charger on the table while people are filling their plates so we opted not to use them. I really need to borrow some of this from her because she has an extensive collection and it is so beautiful on a table. So there you have the last of the Christmas tables! We will be celebrating "Los Tres Reyes Magos" Puerto Rican style with pork roast, rice and beans to end the holiday. The kids will leave boxes with grass under their beds tomorrow night to feed the three king's camels. In return, the three kings will leave gifts. I LOVE this tradition because it focuses on the birth of the Christ-child and not Santa. Plus, it extends the Christmas holidays just a little longer. Your photos are really beautiful! The table looks amazing. Nice job. Your blog is one of my go-to destinations for home inspiration! Anita, as always, such a stunning tablescape! Your centerpieces are some of the most beautiful that I have ever seen! You always make everything look gorgeous! 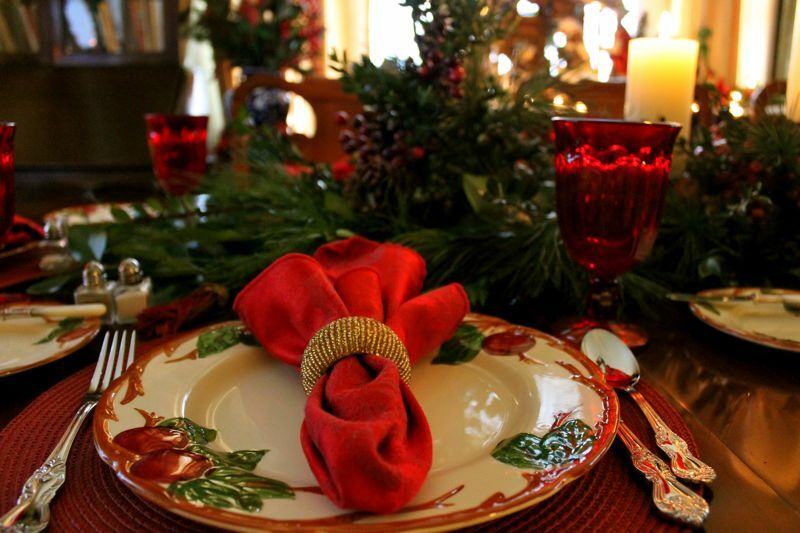 Those are some of my favorite dishes... and so perfect for a Holiday table! What a gorgeous table! 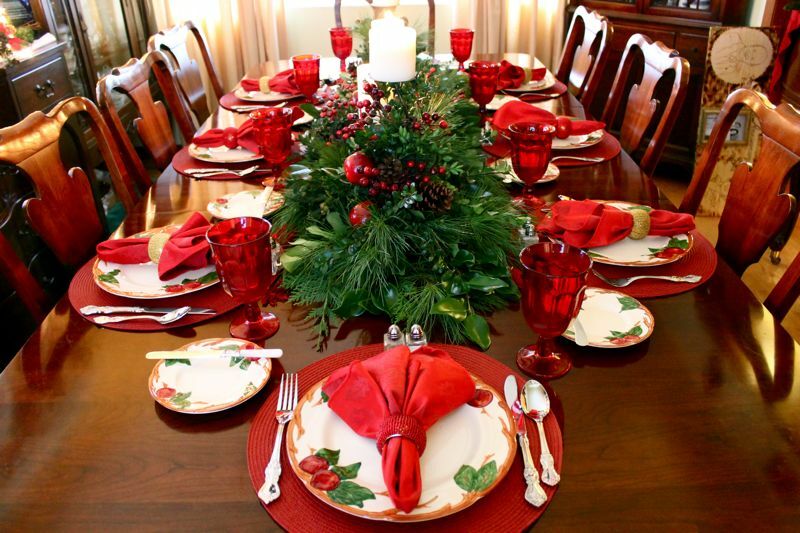 The Franciscan Apple is perfect for Christmas, and your centerpiece really makes the table extra-special! Woweeeeeee, missus! That' is completely and utterly gorgeous. I just wish I could see it in person. You somehow manage to pull off completely lovely with incredibly welcoming- not sure how you manage it every time!! I love it for the same reason, Anita. Growing up in the Catholic schools, this was stressed so much. My Mom made sure we understood it, too! Beautiful table and exquisite centerpiece!!! You did a really great job on it! The dishes were a perfect choice because they're not specifically "Christmas" but still have a bright, cheerful appearance. The rose-covered valance over the windows go perfectly with the table setting!!! What a beautiful table. Her dishes just look so festive! I'm sure your Mom was thrilled withhow beautiful the table looked. I love the centerpiece with all the greenery & candles. Happy New Year!! How pretty this is! My mother had that same pattern. Brings back happy memories. Anita! YOU ARE AMAZING!!! Those rich reds just send this over the top! Your centerpiece makes me swoon!!!!!!!! 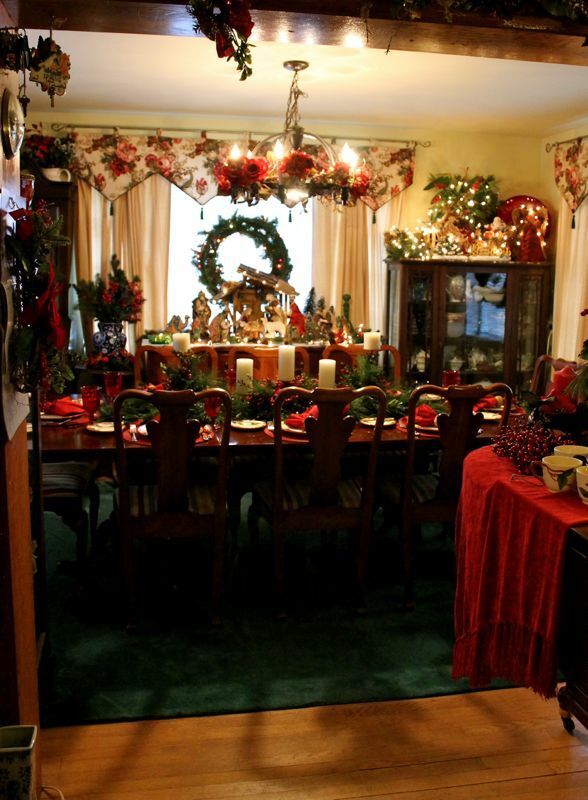 What a wonderful tradition Anita and what a beautiful home your parents have! That centerpiece is GORGEOUS!! Wow amazingly beautiful!! Love it! 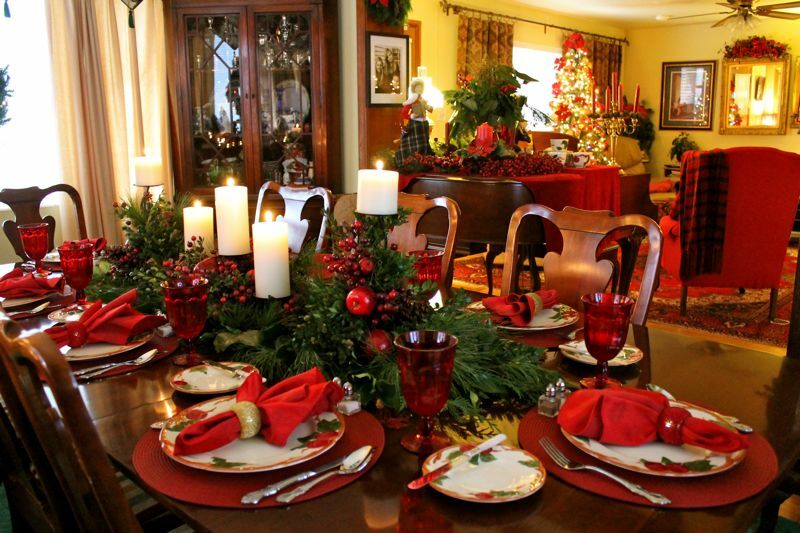 Beautiful traditions and beautiful table. 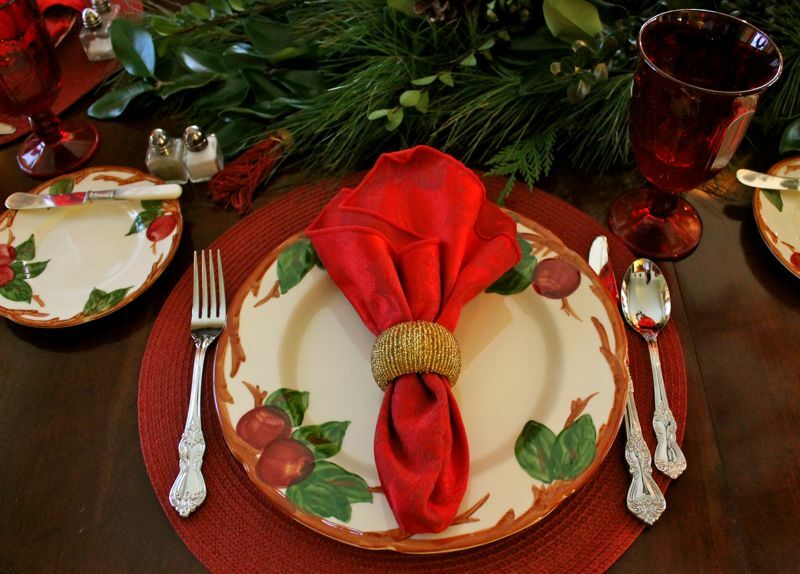 The Fransiscan Apple china goes so well with your centerpiece. Oh so beautiful! My mom has this pattern too. I love your tradition with your children. Something else I'll need to start next year! Blessings!! What a beautiful table and the centerpiece is soo pretty. Great job. So lovely and so special. I haven't seen Franciscan Apple used much anymore and I have always admired Franciscan dishes. The Apple pattern is made for Christmas. What a lucky family to have you design such a wonderful table for them. Gorgeous! Hi Anita, gorgeous table and post.My mother has the sister pattern of Desert Rose. It was her wedding pattern. 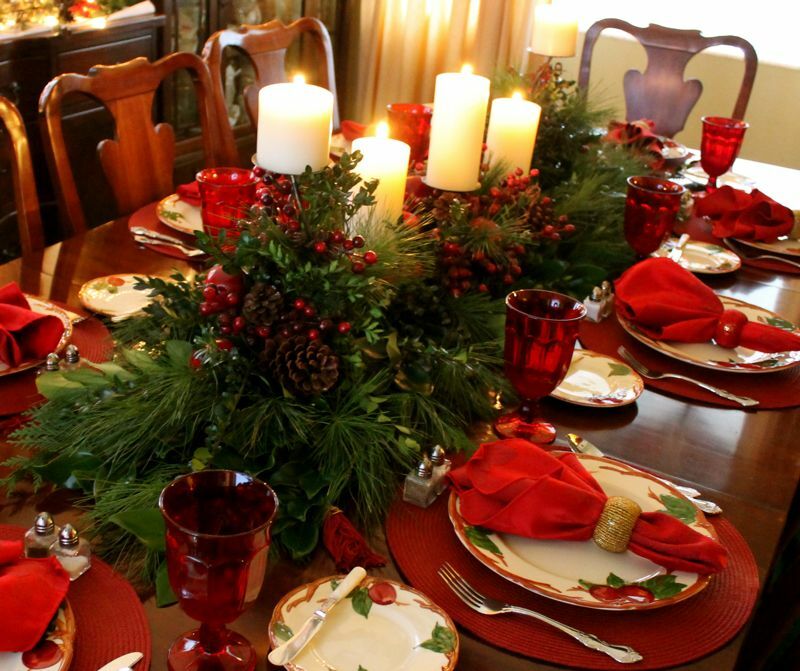 The table is just radiant with red deep berries and gleaming green foliage.I love what the long Biltmore look you created and the candles placed among the greenery. You are so blessed to have your parents near and dear, of course I don't have to tell you!We will be celebrating Little Christmas as well.It is so sad to see all of Christmas disappear almost on Christmas!Thank you for sharing your mother's gracious home. I have a china closet very similar that was hand made by German family that helped my grandfather as a new citizen to America, his sister and mother are my namesake. Thank you and Happy Epiphany hugs and best wishes. Gorgeous table!! I love red and you have used it perfectly. Your centerpiece is stunning!!! Have a Happy, Healthy New Year! I love the choice of the apple dinnerware rather than a standard Christmas one. It's perfect, and your centerpiece is wonderful as usual! Hope you're having a nice time enjoying Los Tres Reyes Magos. (Hope I got that right.) It sounds like the perfect way to finish the season. What a wonderful table you created for your mom! I thought that centerpiece was a "ready-made" faux one because it looked so PERFECT! Amazing that you gathered all the greenery and put it together so wonderfully! The "apple" dishes look very Christmas-y with all the other elements. I've never heard of the "feeding the camels" tradition but it sounds great for the reasons you mentioned. That was one gorgeous table! I also love the backgound of the little white lights and the Nativity. So pretty! Vibrant red goblets are stunning. The centerpiece is a masterpiece...gorgeous. that's suppose to be loVe! Anita! I love your blog! I just had the chance to catch up with you since I've been out of town and I want to tell you that your tablescapes are awesome. I've really had a wonderful time. Thanks. What a great idea to use the Apple Franciscan. What a beautiful table and welcoming room. I LOVE your nativity on the buffet! I "googled" Franciscan Apple Christmas" to find something Christmas-y to give my Franciscan-Apple-loving-sister this year (hoping to find a store selling Franciscan Apple dinnerware) and was DELIGHTED to get a "hit" to your "...Far Above Rubies" blog, KNOWING it's from Proverbs 31! After reading your page, I can see that you truly ARE a "Proverbs 31 woman, and I KNOW this because your theme above all else is that you want to keep a Christ-centered Christmas! He must be delighted in you about that! The beauty of the Lord is evident in all you set your hand to! And even MORE than the beauty you've created, there's an uncommon tranquility in these rooms, and an orderly nature which surely communicates PEACE to your Christmas guests! You obviously have the gift of hospitality! Your willingness to open your home and to do ALL THIS for others to come & enjoy is commendable my dear! You've made your home a sanctuary for the soul, a peaceful place for fellowship! I wouldn't be surprised if He directs weary souls your way, those in need of a time of refreshment! I'm sure that time spent in your home honoring the Prince Of Peace the way you do, would leave your guests saying (as King David did) that "He leads me besides the still waters & restoreth my soul!" May your noble heart's desire (to keep a Christ-centered Christmas) be blessed always, and know that your worth IS far above rubies! Your heart is priceless in His sight, I am sure! 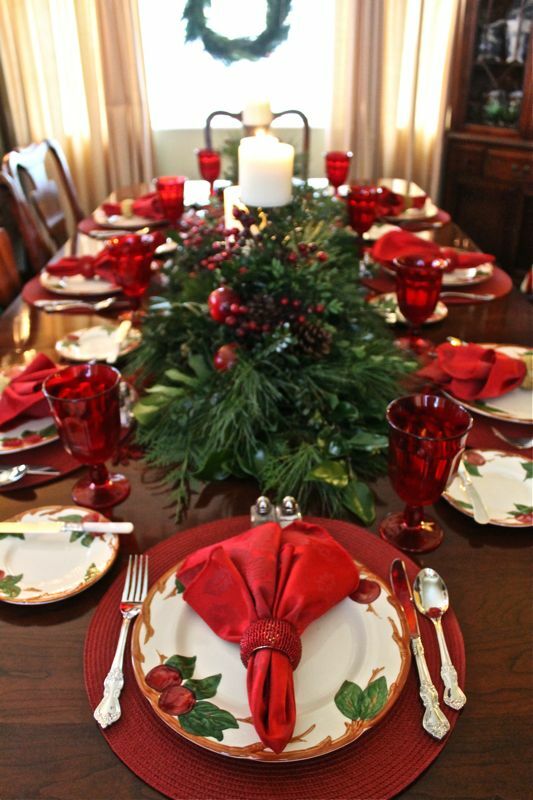 I was so delighted to find your Christmas Franciscan table setting photos on Pinterest. Gorgeous! Lovely. I also wanted to let you know if you don't know there is a Franciscan tablecloth that matches the dishes. I have it to match my set of Franciscan dishes. Also, I love love love these red glasses on your Mom's table. Merry Christmas to you and yours! Oh so beautiful!! 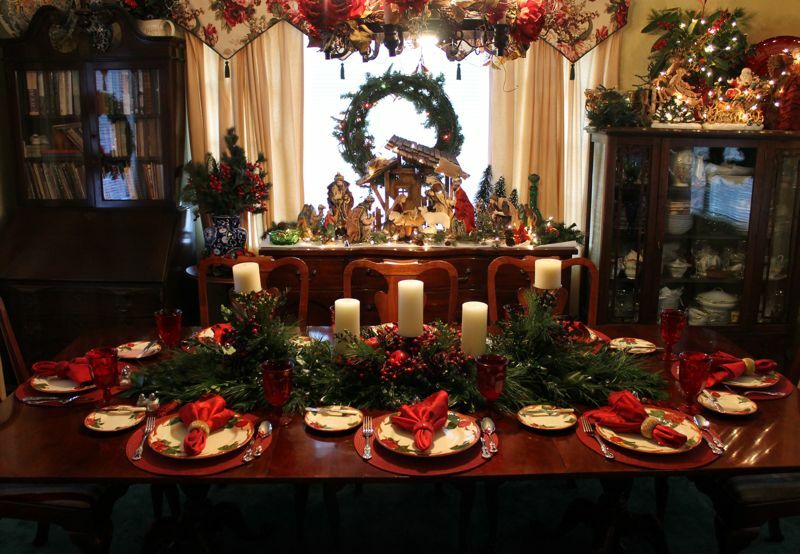 All the photos of your Christmas table setting..I just discovered I have one of those plates..where it came from I do not recall..so beautiful used for your table..You know how to make everything so nice and beautiful, Anita. "MERRY CHRISTMAS to you and yours">>>>Carolyn Marks..